Woke to light rain, breakfasted on chocolate croissants, Kristen got her fill of Powerpuff Girls (Super-Nanas, in French), and headed to the Grotte de Rouffignac 20 minutes away. Got there at the perfect time to start the 11:00 tour via underground train. The guide, fluent in heavily-accented English, took us 1 km and back through the cave (55m underground) on the train, and showed us Magdalenian cave paintings 13,000 years old – of mammoth, ibex, horses, goats and bison that were skillfully drawn so long ago. We bought some slides (Jill lost them). Kristen liked it a lot. We also saw many pre-Magdalenian scratchings from the claws of bears and other mammals that used to hibernate in the cave, as well as their ancient, hollowed-out dens. Since we were driving by, we also stopped at Chateau De L’Herm, a ruined castle from the 1500’s (and before), some of whose proprietors has committed 10 murders between them as a couple. 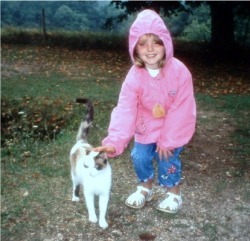 Kristen befriended a kitten, and Dave took photos in the rain. Back home for a late picnic lunch at the kitchen table. Much indecision as to what to do, due to the rainy weather, and the fact that the house is equally inconvenient to everywhere. Finally headed off to Perigueux, and it stopped raining. 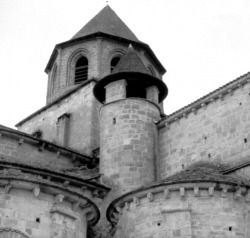 Enjoyed the church, which Freda White in Three Rivers of France disliked as too cold. Maybe we liked it because of the organist playing a famous Bach (?) piece that appears in horror movies, loud enough to rattle Jill’s eardrums. Walked around the old town and Dave enjoyed the national boules tournament, where 200 games were going on at once! These guys are good! Also had some good frites and a Fanta for Kristen. Also found the judging for a contest where various artists had painted / sketched various Perigueux scenes, today. Back home and decided to cook at home, since its Sunday night and not too many restaurants around here. She’s making chicken cutlets, potatoes au gratin (with St. Nectaire fermier cheese, yum), and haricots verts. Should be great.